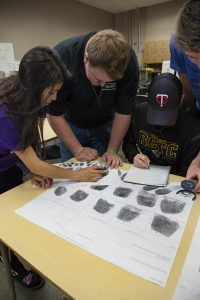 Welcome to RCTC’s Assessment of Student Learning page. Assessment is how we determine that what we’re doing, inside and outside of the classroom, improves student learning. 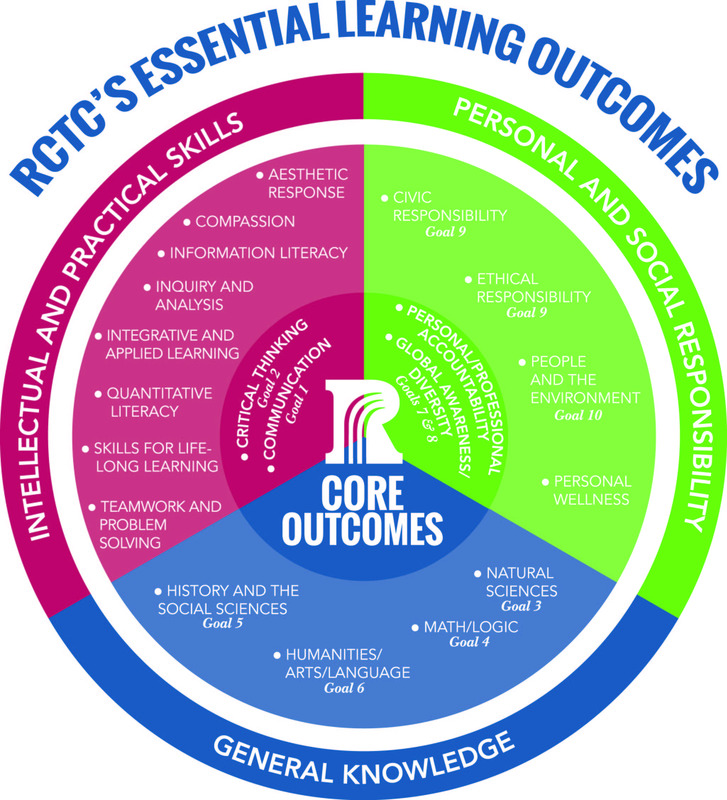 In the fall 2016 semester, RCTC started an ambitious three-year commitment to embed student learning assessment as part of RCTC’s culture. We now have a well-established campus culture of assessment. If you have questions or feedback about assessment at RCTC, please contact Mike Mutschelknaus, assessment web site manager. Current assessment activities: We’re working hard. 2018-2019 professional development calendar: This academic year, we intend to build on our previous successes. Spring 2019 professional development calendar. This calendar has all of the dates, times, and rooms specified for faculty and staff assessment training. 2018-2019 faculty assessment initiatives: Our faculty continue building upon their assessment foundation from the previous year. 2017-2018 professional development calendar: We had 40 training sessions for faculty and staff during the academic year. 2017-2018 faculty assessment initiatives: Our faculty had a robust set of assessment projects that they successfully completed. Assessment of student learning doesn’t just happen. We coordinate our assessment to capture the learning that happens inside and outside the classroom. Much of what we learn in college, after all, occurs outside of the classroom. That’s why assessment is a continual, ongoing process at our College. Each year, faculty and staff complete specific assessments, as the following table shows. At the course level, faculty assess their individual courses (Closing the Loop) and courses with multiple sections (Gateway courses). At the program/discipline level, faculty assess at least two outcomes per year, rotating through the student learning outcomes over a period of four years. Student affairs does the same rotation with their student learning outcomes. Finally, faculty and staff collaborate to assess our College’s four core student learning outcomes on a rotating basis as well. Assessment plans: We’re looking to the future. Student learning is the most important job that any college does. However, student learning doesn’t stay the same from year to year. Courses and programs change. The demographics of our student population change. Technologies change our course delivery methods. That is why assessment planning is so important. Our commitment to planning is reflected in our Institutional Assessment Plan (IAP), which focuses on faculty, student affairs, and college-wide assessment. The IAP is the master plan that guides all assessment at our College. We systematically keep track of all our assessment data in the IAP with Taskstream, a subsidiary of Watermark. Student learning outcomes: We care what our students learn. Student learning outcomes (SLOs), quite simply, are the skills and abilities we strive to instill in our students. Our SLOs are focused, specific, and measurable. In order to make sure our students are learning, we—as a college—must be able to specify and measure what we want our students to learn. That’s why outcomes are so important, at every level of the college. College assessment: Faculty and staff use Essential Learning Outcomes to improve the student experience at our College. We have four college core outcomes that we assess inside and outside the classroom. Student affairs assessment: Student affairs SLOs help improve the quality of student life activities as well as student understanding of key processes, like the next step in enrollment, at our College. Course assessment: Our common course outlines have SLOs that faculty use to assess student learning in their individual courses and in shared courses as well. 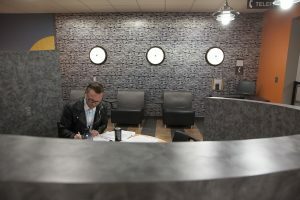 Sections of the same course that are taught by many faculty—such as speech, psychology, and freshman composition—are examples of shared courses. These assessments improve courses. Program and discipline assessment: Faculty assess their curriculum with program/discipline learning outcomes. These outcomes are available on each program/discipline home page. Degrees, certificates, and course sequences are all examples of curriculum. These assessments improve our multiple-course sequences. Assessment resources: We make sure we have the right tools. Assessing student learning takes time, energy, and people. That’s why our college makes sure we have the necessary resources to further our efforts on behalf of student learning. We have a dedicated Assessment of Student Learning Committee. Our administration is committed to embedding a culture of assessment. Our faculty and staff care deeply about assessing student learning because learning is how we help our students have bright futures. Here’s how we help our faculty and staff. Aqua assessment software helps us to collect student work, use rubrics for assessing that work, and analyze the results. As members of The Higher Learning Commission Assessment Academy, we gain valuable feedback from our mentors and our peer colleges. Faculty Instructional Development Grants (FIDG) provide stipends for faculty engaged in assessment projects. We rely upon the collected repositories of wisdom from the National Institute for Learning Outcomes Assessment and the Association of American Colleges and Universities. Evidence of student learning: We have proof our students are world-class learners. It’s not enough to assess student learning within our college. We also want to know how our students use that learning once they graduate. We want to know that they have the necessary skills to achieve their goals. The evidence shows that our students graduate with the skills they need. In 2017, all of our surgical technology students successfully passed their certification test on their first attempts for a pass rate of 100 percent. This is in comparison to the national pass rate average of 69%. In 2017, all of our dental assistant students successfully passed their board exams as well. In 2017, all of our dental hygiene students passed their board exams on their first attempts, for a pass rate of 100 percent. This is in comparison to the national pass rate of 93.9 percent. In 2015, 2016, and 2017, our practical nursing students have had job placement rates of 90% (2015), 89% (2016) and 90% (2017). 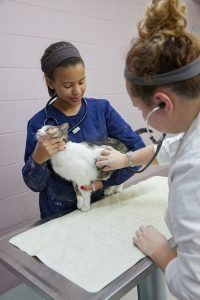 The Practical Nursing Program is ranked #3 in Minnesota, based on NCLEX-PN exam pass rates and the numbers of students at each college taking this exam. As one final example of student learning evidence, our graduating students were surveyed during 2016 fiscal year to find out if they had a successful outcome from their RCTC education. A successful outcome is defined as a student employed in her area of study or as a student continuing her education. Clearly, our students benefit from their education at our College. Use of student learning evidence: We use our assessments to improve student learning. We also assess student learning because we want to make improvements. We are always trying to find ways to make our courses, programs, and degrees even more effective. These continuous improvement efforts are displayed in our most recent newsletter, our gateway course assessments, and our college core outcome assessment process. Spring 2019 assessment newsletter: In this newsletter, results from the Global Awareness and diversity core outcome assessment are explained. There is also a “Closing the Loop” update and highlights from the fall 2018 Higher Learning Commission Assessment Academy. Finally, core outcome and gateway course assessment are highlighted. Spring 2018 assessment newsletter: This newsletter highlights how faculty and staff throughout the college are using their assessment results to make improvements. Admissions and records staff have increased the percentage of enrolled students. Chemistry teachers are improving the quality of their students’ writing. English teachers have improved the curriculum for their freshman composition course, one of the largest courses, in terms of sections taught, at our college. The newsletter also shows we have an assessment framework in place that helps us to continue improving. Gateway course assessment: These courses have a large number of students enrolled, such as freshman composition, or serve as pre-requisites for other degrees and programs, such as biology. During the 2017/2018 academic year, faculty updated the learning objectives in 20 out of 23 gateway courses as a result of assessment projects. Global Awareness and Diversity (GAD) college core outcome assessment: During the 2017-2018 academic year, our College developed a systematic method to assess the GAD core outcome. This process is an example of how assessment shapes student learning. First, faculty and staff collectively developed the GAD core outcome. Based on the core outcome, faculty and staff developed a comprehensive rubric. The Assessment of Student Learning Committee then used the rubric to develop specific assignment guidelines for teachers in courses that met GAD outcomes. These teachers developed assignments for the GAD college core outcome assessment. From those assignments, 582 student artifacts were collected, a significant number. In May 2018, twelve faculty and staff were trained on how to use the GAD rubric to assess those student artifacts. They then scored 309 of the student artifacts, using Aqua assessment software by Watermark. The results of this project will soon be shared publicly. This GAD assessment will be repeated again this academic year. We will check to see if improvements we have made as a result of the process have led to better student performance. (The goal is to improve student learning!) In addition, our College will use a similar process to assess the Personal and Professional Accountability college core outcome in 2018-2019. The following resources and instructional videos help faculty and staff do their assessment work.